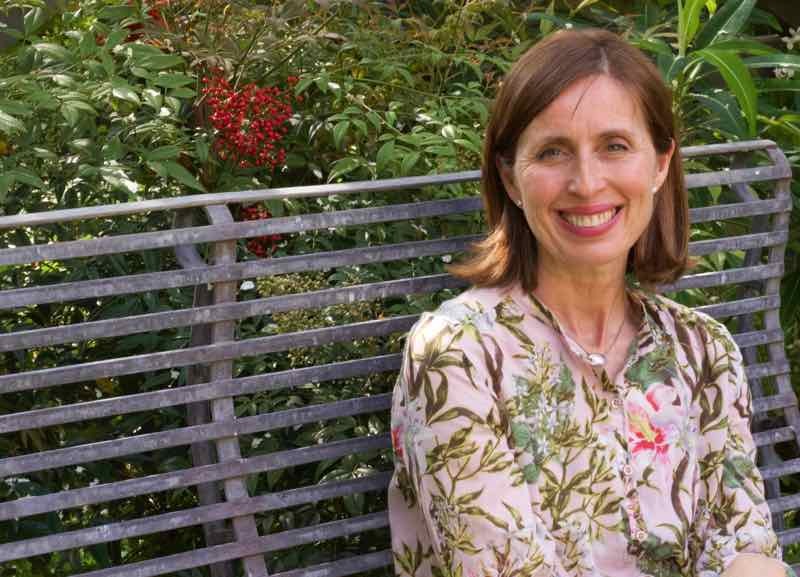 ABOVE: NON MORRIS, GARDEN DESIGNER AND AUTHOR OF THE DAHLIA PAPERS, ENJOYS HER GARDEN IN A MATCHING SHIRT BY ONE OF HER FAVOURITE DESIGNERS, ISABEL MARANT ÉTOILE. 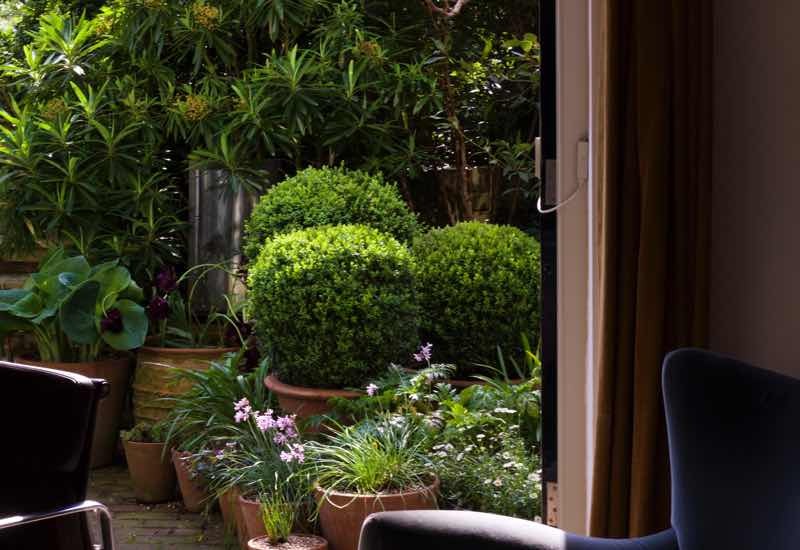 London-based garden designer and garden writer Non Morris, author of the blog The Dahlia Papers and co-founder of Fraser & Morris, is partial to self-seeders — plants that seed and sow on their own with no direction or guidance whatsoever. For a busy mother of three teenage boys, including a pair of twins, anything that takes care of itself has an obvious appeal. But what Non finds most interesting is where the self-seeders manage to end up and in particular, what it is they actually do when they get there. Curious about self-seeders potentially running amok in her Camberwell, South London garden, I recently stopped in for an afternoon chat and found a glorious and calm oasis in the midst of displaying its late spring finery. The renegade self-seeders — Libertia grandiflora – with sword shaped leaves and bright white flowers along with the pale green bell-flowered flowered Tellima grandiflora — had found homes for themselves amongst the handmade brick pavers, making their own unique contribution to the blooming revel. 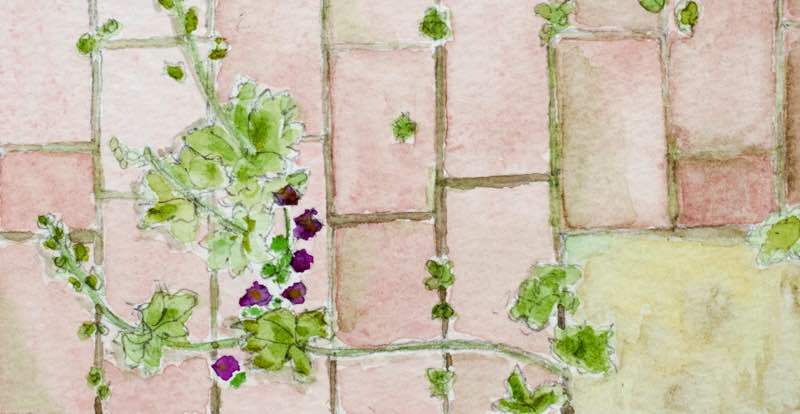 Discussing plants and parenting, Non kindly shares her thoughts about how the two integrate and intertwine in her garden designs. 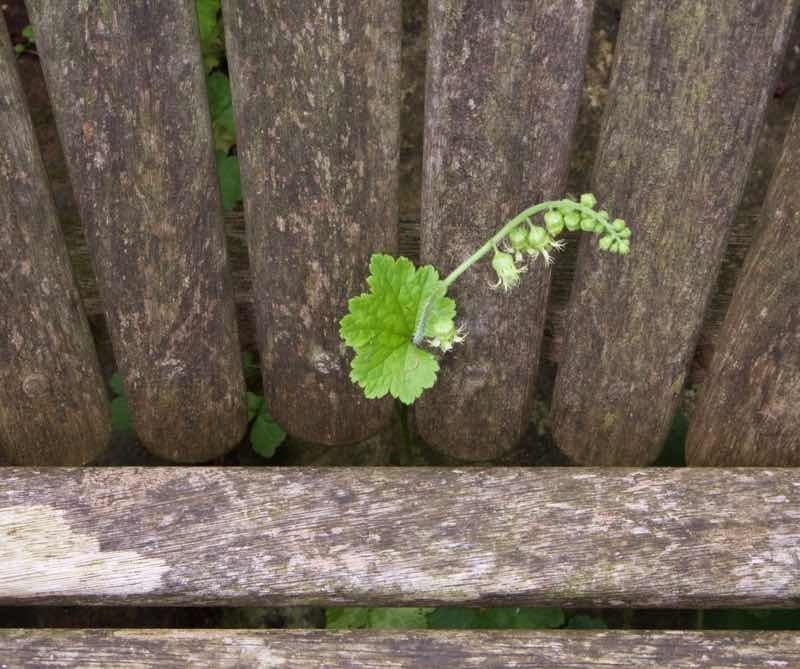 ABOVE: A WISP OF THE SELF-SEEDING TELLIMA GRANDIFLORA BEGINS TO POKE THROUGH A GAP IN THE GARDEN CHAIRS. Fabulous Fabsters: Garden design is a second career for you. What did you do before this? Non Morris: After reading History of Art and Modern Languages at Cambridge, I worked in film and TV production developing scripts and producing drama for an independent production company. I enjoyed the work immensely, began writing scripts myself, and thought I would continue working in the industry when I had twin boys twenty years ago. After they were born though, something shifted for me. We also happened to be in the process of renovating a Victorian house that had been stripped down to the bare bones and lived in as a squat — I realised I couldn’t do it all. I wanted to be with the boys and at the same time, I felt strongly about wanting to work with the earth. 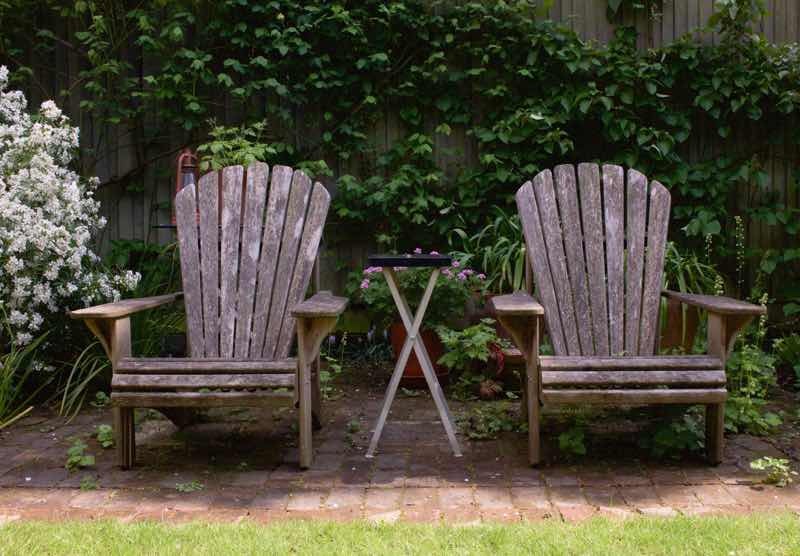 ABOVE: TWO WEATHERED ADIRONDACK CHAIRS MARK A QUIET SPOT FOR AN AFTERNOON CHAT. FF: How did you realise that you were meant to be a garden designer? NM: Camberwell Grove the street where we live is known for its magnolia trees against white stucco houses. When we were renovating the house, I started to research magnolias for the garden. One day in the middle of reading an article, I had one of those amazing moments when I came to realise the extraordinary scale and subtlety of the plant world — enough to keep you going for a long time. When my third son — now age sixteen — started nursery, I retrained in plantsmanship and horticulture at The English Gardening School at the Chelsea Physic Garden. In 2009, I started a garden design practice Fraser & Morris, with Helen Fraser, a fellow student I had met on my gardening course. ABOVE: VIEW OF LIMESTONE STEPS LEADING UP TO THE MAIN PART OF THE GARDEN FROM THE LOWER DINING TERRACE. 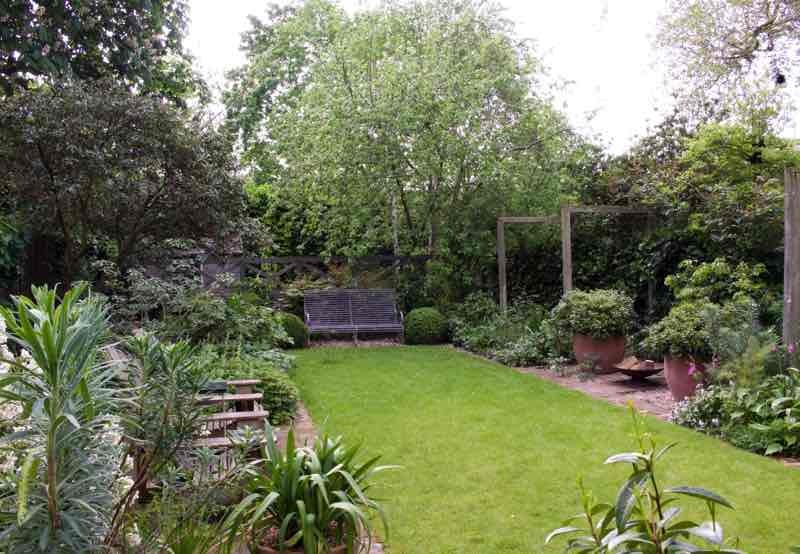 FF: Tell us about the gardens that you and Helen design? NM: As you might expect, the principal focus of each of our gardens are the plants! These are our materials and we use them in a careful and thoughtful way to shape and form our clients’ gardens and to create atmosphere, a sense of place. 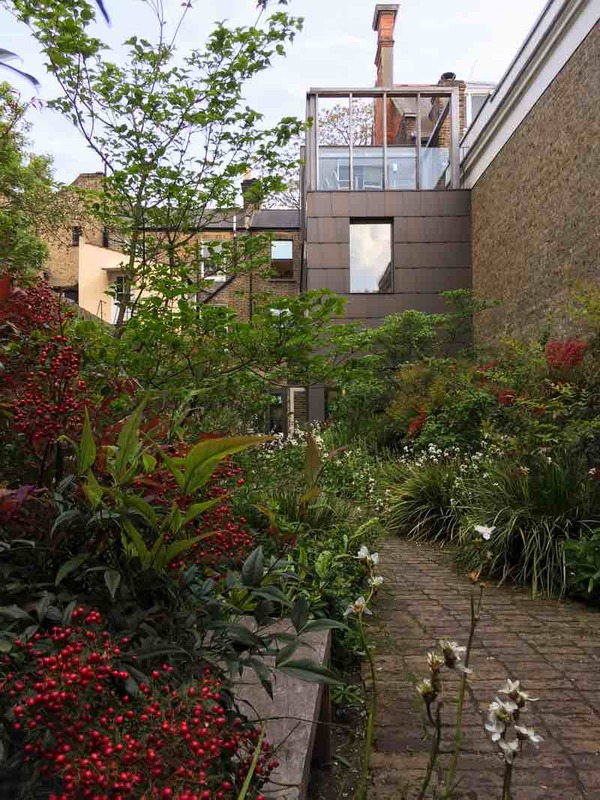 ABOVE: THE LONG AND NARROW LONDON GARDEN IS STRUCTURED AROUND A BRICK EDGED LAWN, SURROUNDED ON ALL SIDES BY LUSH PLANTING WHICH PROVIDES CHANGE AND INTEREST THROUGHOUT THE YEAR. FF: How do you start a designing a garden? NM: We always start by asking our clients questions. How are you going to use the garden? Which time of year is most important to you? Do you have a favourite garden or perhaps a favourite memory of a garden? Do you want to grow things to eat in the garden? Do you have time to work in the garden? What about colour, scent, places to play, places to sit? From their answers, we aspire to work out what it is they really want from their garden. It’s about matching their expectations with what we can do and they can maintain. 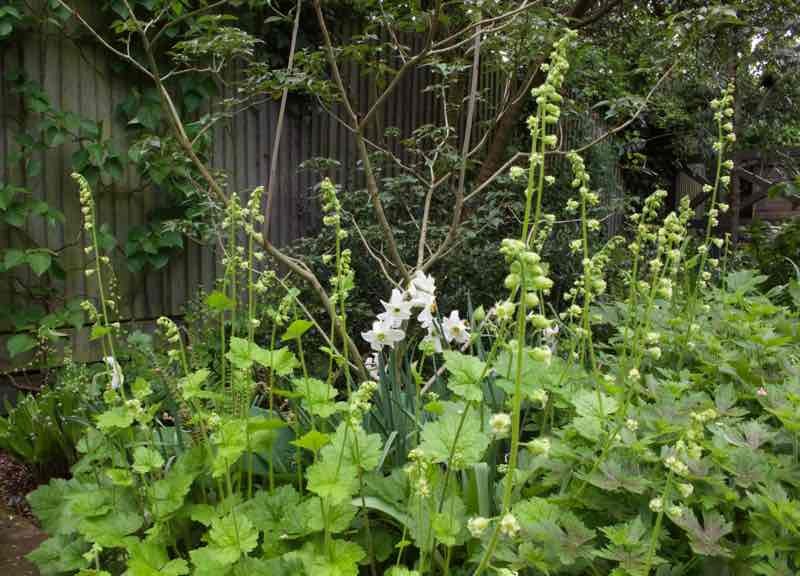 A client may hanker after a Tudor herb garden and beds of rare fruit and vegetables but what they may need is an elegant low maintenance garden which creates first and foremost a sense of privacy. The best part of the job is when clients ring you up the following spring to say how thrilled — and often how surprised — they are with the garden that seems to have suddenly emerged. ABOVE: THE VIEW FROM THE REAR OF THE GARDEN LOOKS ONTO THE PLAIN AND UNADORNED BACKS OF THE TERRACED HOUSES. FF: What do you think about when you are working out a planting scheme? NM: Our ideal gardens are ones that evolve during the course of the year. Creating a planting scheme which maintains year round interest but which offers change too is complex. Keeping the colours and heights in mind along with various bloom times is like planning a journey. And of course, every site has its own specific conditions. 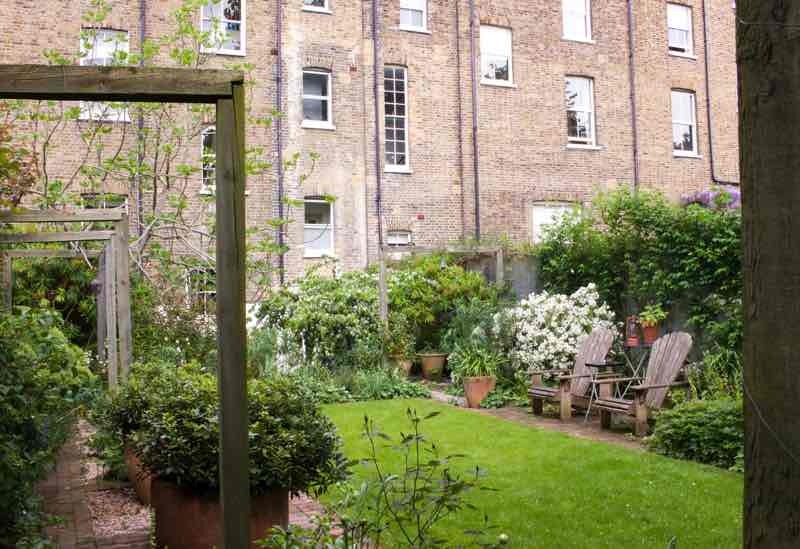 For instance in townhouses with their long and narrow gardens, one of the challenges is to keep the planting in balance — one side is nearly always going to be sunny and the other shady. In country or more rural settings, there are different considerations. In Sussex, we designed a new area of a large country garden and enjoyed the chance to use native plants and trees to extend the existing woodland and native marginal plants to make the new pond look as if it had always been there. 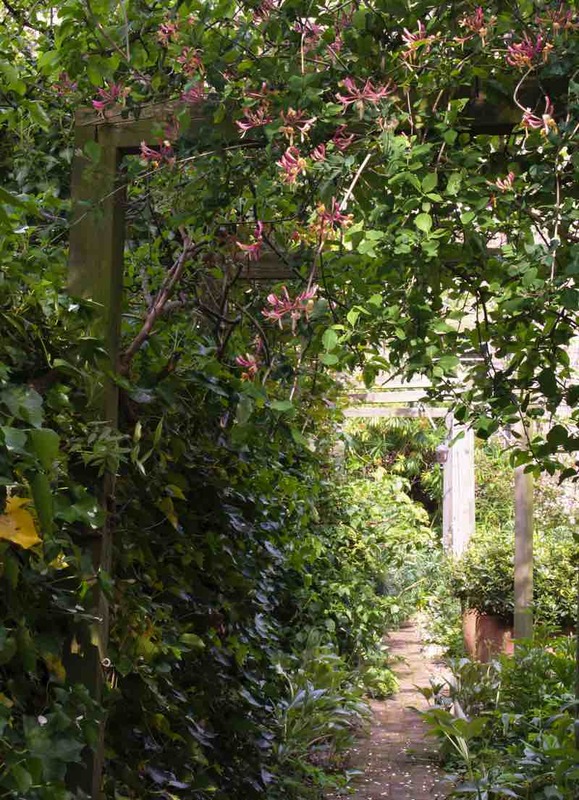 ABOVE: HONEYSUCKLE CLIMBS AROUND ELEGANT SQUARE-FRAMED ARCHES WHICH DESIGNATE A PATH ON THE SIDE OF THE GARDEN. FF: Your biggest tip for a successful garden? NM: Be disciplined when developing a planting scheme, repeat plants and limit your palette rather than use too many different things. Go to the trouble of sourcing exactly the right plants, prepare the ground thoroughly, plant well, go back and keep going back. It’s important that our clients understand that garden designs are not static. They will change and that’s not a bad thing. The key is to continually nurture them, much like children. If something doesn’t work, change tack, introduce something new and step back and watch what it does. 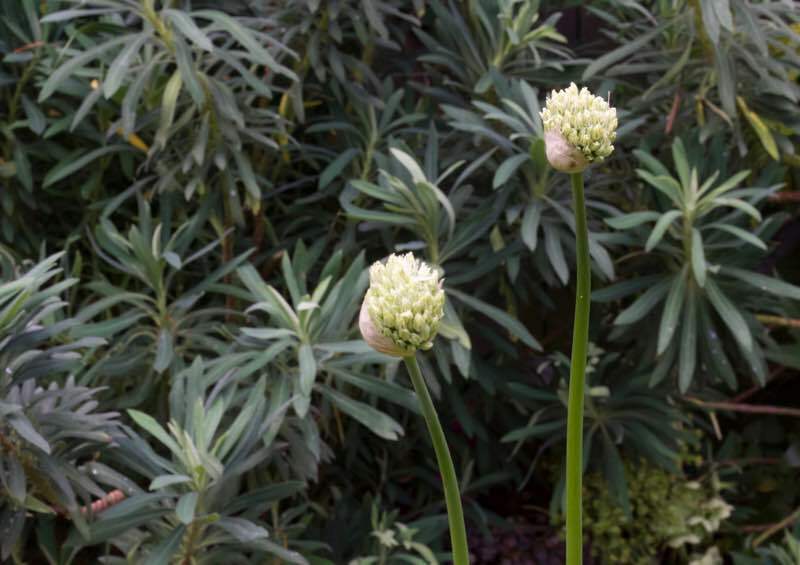 ABOVE: THE JUST OPENING BUDS OF THE FLAT BOTTOMED WHITE ALLIUM NIGRUM COMPLEMENT THE GLAUCOUS FOLIAGE OF EUPHORBIA CHARACIAS — “A FANTASTIC EVERGREEN SHRUB FOR A WELL DRAINED GARDEN, ITS HUGE HEADS OF CHARTREUSE GREEN FLOWERS LIGHT UP THE ENTIRE GARDEN FROM JANUARY TO MAY,” NON SAYS. ABOVE: “NARCISSUS ‘PETREL’, A MULTI HEADED SMALL WHITE NARCISSUS WITH A POWERFUL SCENT SITS IN A POOL OF TELLIMA GRANDIFLORA — “A WONDERFUL PLANT WITH ELEGANT STEMS OF TINY PALE GREEN FLOWERS WHICH ARE FANTASTIC AGAINST A VELVETY YEW HEDGE OR FOR LIGHTENING UP A SHADIER PART OF THE GARDEN,” NON SAYS. FF: Tell us more about your blog The Dahlia Papers. NM: My starting point was the treasure trove quality of Edward Steichen’s archives on plant breeding known as the ‘Delphinium Papers’. Steichen was a top US fashion photographer for Condé Nast in the 30’s but was also a passionate plantsman and breeder of enormous, towering Delphiniums (up to 7 feet) even creating a show for MoMA – the first and only show dedicated to flowers in the museum. My good friend Charlie Lee Potter’s blog Eggs On The Roof was another inspiration. As a writer and a cook, she writes about her two great passions, literature and food. The Dahlia Papers is a journal of what I am looking at and thinking about — it’s about plants and gardens but also about art, photography, design, architecture and the environment. I was delighted to be one of the three ‘gardening bloggers you should be following’ according to Sunday Telegraph journalist, Francine Raymond earlier this year. ABOVE: THE VIEW FROM NON’S OFFICE ONTO THE TERRACE OF HER GARDEN PROVIDE HER WITH YEAR ROUND INSPIRATION. FF: What have you enjoyed most about writing The Dahlia Papers? NM: I love the freedom of writing a blog because it offers me a very fluid approach to thinking and writing about gardens. I combined a post about Edmund de Waal’s white porcelain with my thoughts on the use of white plants in the garden and at Sissinghurst in particular. And my ever increasing interest in working out why plants thrive in the right place led me to travel to the Apennines this May with botanist, Dr. Bob Gibbons, to see hillsides of wild narcissus and wild tulips for myself. I have met all sorts of people through blogging. I have made new friends from around the world, met new clients who are interested in the same ideas and established new relationships with head gardeners and garden designers from all over the UK. 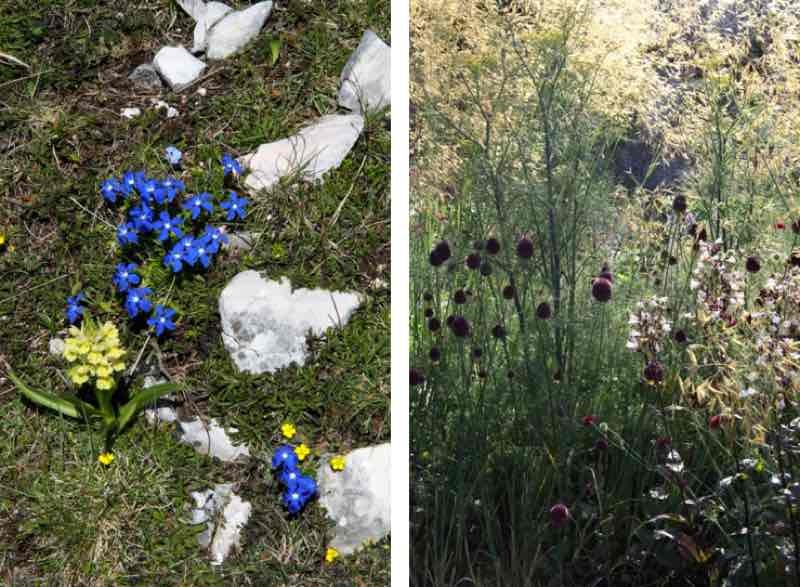 ABOVE L: WILD FLOWER HUNTING IN THE APENNINES — SPRING GENTIAN (GENTIANA VERNA) AND ROCK ROSE (HELIANTHEMUM NUMMULARIUM) HUG THE HILLSIDE. “I LOVE THE PATTERN THE GENTIANS AND ROCK ROSE MAKE WITH THE BRIGHT WHITE LIMESTONE ROCKS,” NON SAYS. ABOVE R: “IN A SHELTERED WALLED GARDEN IN SUFFOLK, IT WAS EXCITING TO CREATE AN EXUBERANT MIDSUMMER PLANTING SCHEME USING THE GORGEOUS FIREWORK OF A GRASS (STIPA GINGANTIA) AS THE KEY PLANT,” NON SAYS. PHOTOGRAPHS BY NON MORRIS. FF: Are there any Fraser & Morris gardens that we can visit? 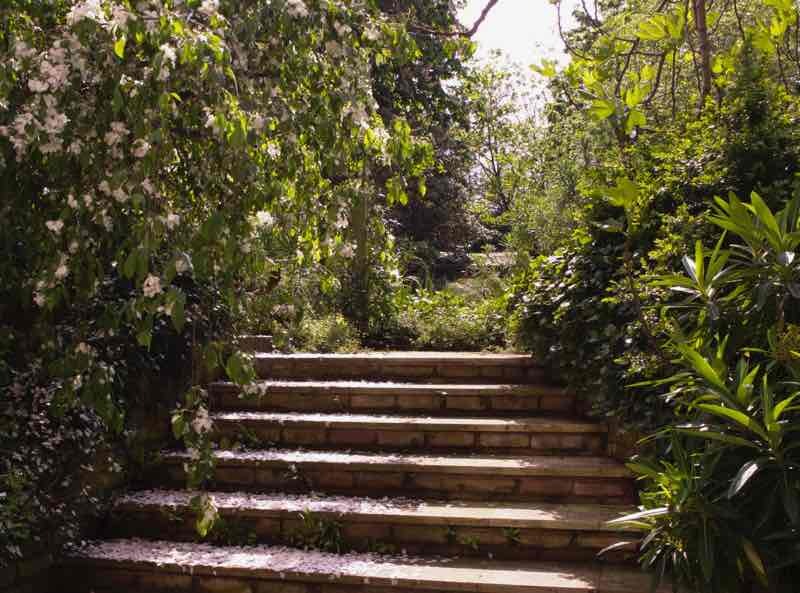 NM: The South London Gallery Fox Garden, which is one of the gardens we feel most proud of. We love the idea that it is accessible to anyone throughout the year. It is a real garden, properly and sensitively cared for. It surprises people coming away from the bustle of Peckham Road because of its lushness, its powerful midwinter scent, its rich and changing seasonal colour and because of the way it is literally used as an extension of the Gallery – currently as part of a major Latin American exhibition ‘Under the Same Sun’ in collaboration with the Guggenheim. ABOVE: PLANTING SCHEME DESIGNED BY FRASER & MORRIS FOR THE FOX GARDEN AT THE SOUTH LONDON GALLERY. 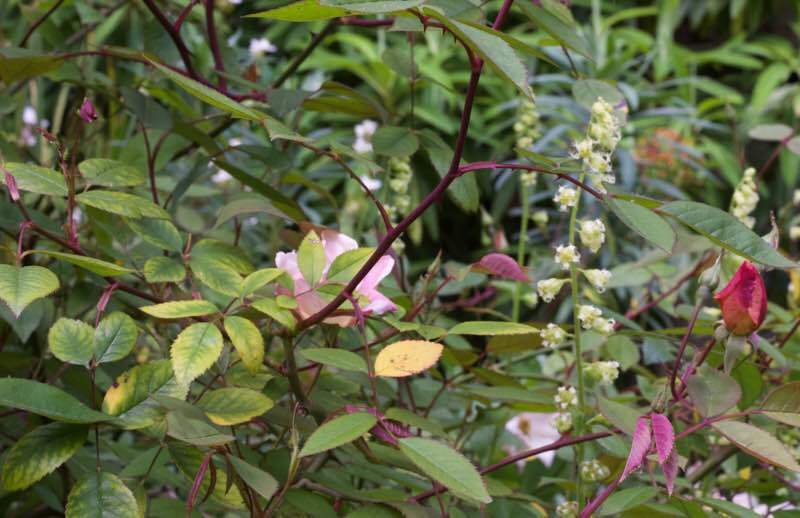 THE RED-BERRIED ‘HEAVENLY BAMBOO’, (NANDINA DOMESTICA) PLAYS A VITAL ROLE WITH ITS STRONG COLOUR. THE WHITE FLOWERED LIBERTIA GRANDIFLORAL LIGHTS UP THE CURVED PATH. NM: My uniform is slightly baggy jeans with a simple Doe leather belt by my good friend Deborah Thomas, and either a fall-in-love-with shirt (perhaps from Isabel Marant Etoile or Cos) or a navy blue polo neck cashmere jumper from Margaret Howell. I wear my favourite clothes until they fall apart. My treasure trove is The Cross at Clarendon Cross where I buy Samantha Sung summer dresses in bright blue and white, the black three quarter sleeve English Weather cashmere jumper that gets me through the winter with my A-line black leather skirt and the crinkly Dosa skirt in navy blue silk that has lasted for years. When I need something more dressy than Converse or Birkenstocks, I go to Robert Clergerie for perfect, completely plain back suede boots in winter or slightly wild salmon pink and khaki platform sandals in summer. ABOVE L: PREPARING FOR HER GARDENING CAREER AT THE AGE OF 5. ABOVE R: STILL IN HER GARDEN AND STILL IN BLUE. PHOTOGRAPH BY NICK CROSS. NM: The key ingredients are always lemon, garlic, tomatoes, olive oil most often with good bread, pasta, salad, wine. Pasta with a puttanesca sauce – made with tomatoes, garlic, anchovies, chilli, olives, bay and capers with a salad of raw fennel dressed with lemon juice and olive oil is possibly my favourite supper. I like simple, peasant food — often vegetarian but then I will happily succumb to a good tagliata, steak cooked with lemon, garlic, rosemary and olive oil sliced over a rocket salad. Diana Henry is the Goddess of tagliata. Breakfasts are taken pretty seriously at our house – even if there are only two of us. A properly laid table, pink grapefruit in winter and cantaloupe melon in summer, coffee and German rye bread from the General Store in Bellenden Road or toast from the square white loaf you can only buy in the Cheese Block on Lordship Lane. I mail order jars of marmalade by the dozen from Wendy Brandon. 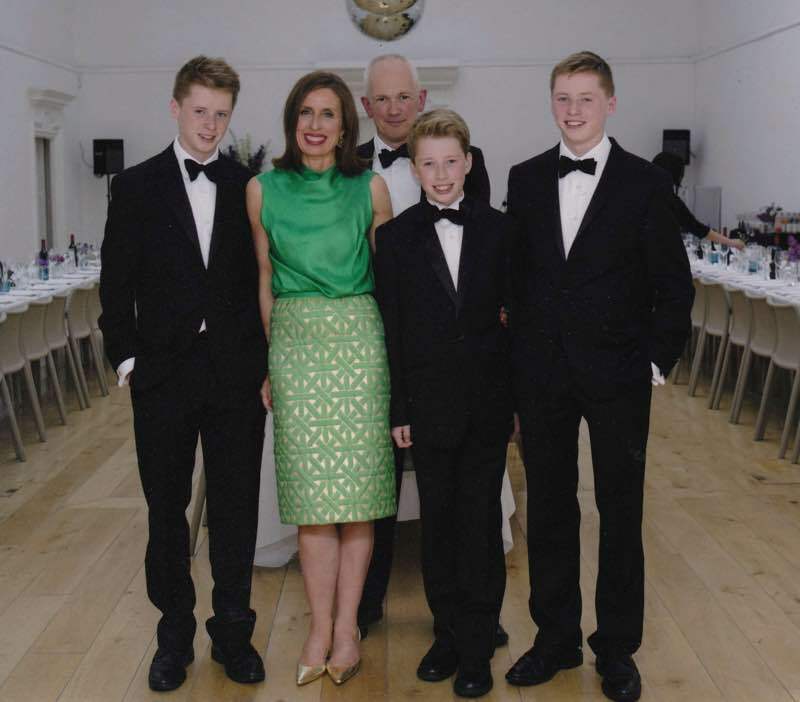 ABOVE L-R: HENRY, NON (IN VINTAGE CHRISTIAN DIOR), NICK, ARTHUR AND LLEWELYN CELEBRATE NON AND NICK’S FIFTIETH BIRTHDAY PARTY AT THE SOUTH LONDON GALLERY. PHOTOGRAPH BY FREDDIE REED. FF: How do you take care of yourself to stay healthy and strong? NM: As well as working in the garden and a weekly Pilates class with Jo Blake, a former dancer and wonderful teacher who has taught three of us at home since we had our youngest children sixteen years ago, I keep fit by walking. I try to walk everywhere now – I know how far it is from home to the Garden Museum (3 miles) or the V&A (6 miles). I have just walked 26.2 miles of the South Downs Trail – from Brighton to Beachy Head to raise money for the Type 1 Diabetes Charity JDRF. Five girlfriends and 9 hours of beautiful countryside, exercise and chat. Above: Non’s self seeders. Artwork by Christine Chang Hanway. A Fabulous Fabster thank you to Non Morris! Does Non make house calls? To California? Why not? She’s already had success in New York. I’m sure she would love to try her planting prowess in California! Thank you, Deborah. Forever indebted to you for introducing me to Non. Another great post, I’m a North Londoner just discovering the joys of South London. Margot (my small granddaughter) and I often have lunch together at the South London gallery and we both love the Fox Garden. Wonderful to know a little more about the designer behind it. I am also a North Londoner and have also been discovering the joys of South London through various Fabsters. I love the image of you and your granddaughter enjoying the Fox Garden and I’m sure Non will too. Really enjoyed this piece, Christine, and I love Non’s garden. So lovely to learn about the Fox Garden, which I will now plan to visit.